Plugin list posts are popular. We are no stranger to them ourselves, what with our plugins of the month series. That is a list with a purpose – 10 unique plugins that you probably haven’t seen yet. Every single plugin adds value. But unfortunately, a lot of plugin list posts don’t really have the reader in mind. The problem is that people like lists. Because of this, bloggers will go out of their way to produce them – even if the end result isn’t even of much value. This post was originally intended to feature several related posts plugins, but as I dug deeper into the available options, it became clear to me that one plugin stood head and shoulders above the rest. So I decided instead to focus on that plugin alone, and demonstrate how it can be utilized to return the best possible results for your blog. Why Bother With Related Posts? If someone doesn’t want to subscribe immediately, you want to keep them on site until they do. And presenting a list of related posts at the bottom of your content can help you achieve that. The logic is simple – if someone has read all the way to the bottom of your post, he or she may well be interested in reading more. Why not make it easy for them? Yet Another Related Posts Plugin (or YARPP for short) is the modestly-named plugin that we are focusing on today. It is by far the most popular plugin of its type available, with over 1.6 million downloads at the time of writing. Last week alone it was downloaded nearly 7,000 times. The popularity of YARPP far exceeds that of any competitor, and whilst that does not alone guarantee it as the best option, its feature set and capabilities do. You are of course welcome to check out the alternatives to YARPP. You can investigate the likes of nrelate Related Content and Related Post Thumbnails should you wish to do so. But in my humble opinion, YARPP has the beating of all of them. Let’s take a look at its settings and investigate why. If you don’t want to display related posts directly below your blog’s content, you need to uncheck “Automatically display related posts?” and manually insert the PHP function within the relevant theme file. The default number of related posts is 5. The ideal number for you should be based upon a consideration of (a) how many posts you have on your blog in total, and (b) how many options you want to offer up (sometimes, less is more). You can choose to format how the related posts are displayed. The standard list format will suit most, and you can see an example of the code used in the top right. You have an option to show the excerpt. I would personally recommend that you keep things simple and ignore this. Results are best ordered by score, so I wouldn’t change the order results. The default display if there are no results is for a “No related posts” message. I think it makes more sense to simply leave this box blank, so that nothing at all is displayed if there are no related posts. If you choose to help promote YARPP, an attribution will be placed under the related posts on every page of your blog in which it is used. This is really messy – if you want to help out the developer, I would recommend making a donation instead. Finally, there is another meta box for RSS display options, which follows the same format as the standard display options. I would recommend that you enable this option and spend a few minutes adjusting the settings accordingly. For those who read your blog posts in their RSS reader, it can be a great way of getting them onto your site. You may feel that YARPP is conspicuous by the absence of a thumbnail option. My personal opinion is that a simple list of headlines is better than thumbnails, but you may of course think otherwise. If that is the case, you can look into creating your own custom YARPP template. If you are not technically-minded, the alternative is to use a plugin such as nrelate Related Content, which gives you graphical options for showing related posts. You will however pay for pretty thumbnails with a relative lack of accuracy in pulling related posts. Once you have finished beautifying your related posts list, you will want to consider whether or not particular posts should be excluded from what YARPP calls the “pool” – i.e. the list of posts from which YARPP selects. Doing so is simple. Above is what the “pool” for my blog looks like. If you cannot see such a box in your settings screen, you may need to select it as visible in the “Screen Options” tab to the top right. As you can see, it is easy enough to omit specific categories and tags, should you wish to do so. You can also choose to include password protected posts, and omit posts that are longer than a specified number of months. It’s not a word, but perhaps it should be. This meta box is where you determine how matches are found, and how relevant a result has to be in order for it to be displayed. In case you didn’t watch the video above, each post on your blog is assigned a score by YARPP based upon its relevance to any other post. That score is assembled by combining individual relevance scores for the headline, content, categories and tags. The match threshold field allows you to determine how high a post must score before being displayed. The default is 5 – as you can see from the above field, I have it set to 3. Setting an appropriate match threshold is entirely subjective – it largely depends upon (a) how relevant you want the posts to be, and (b) how many of them you want to show. The best thing you can do is start with the default setting and check a few posts on your blog by those criteria. 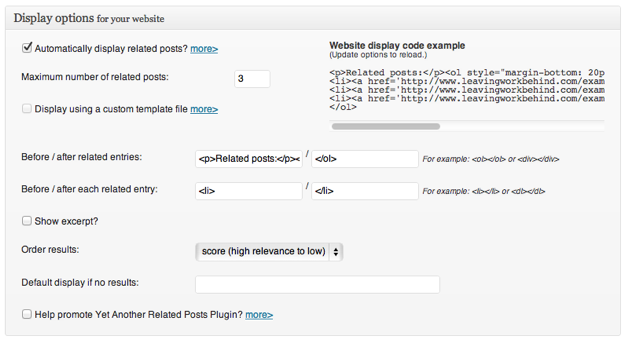 If you wish to change the way in which posts are scored, you can choose to exclude specific datasets (i.e. titles, bodies, categories and tags) from the algorithm. In reality, you can have YARPP up and running in seconds. But spending a few minutes tweaking the plugin to your liking is time well spent, and will ensure that your visitors are presented with the kind of links that will make them want to continue reading your blog. And that is of course the key. Do you use YARPP already? Or will you give it a go now that you have read this post? Let us know in the comments section! I know this thread is old but just in case someone else is looking for help, or someone can tell me what to do. I installed yarpp related posts, and I am using the pro version. First there is almost no help from the developer. Lots of questions in the forum or FAQ but very few answers. It is not all that customizable as you cannot place it easily. In my case I tried to add some padding so it would not be stuck on the edge of th page, nothing worked. I cannot remove the attribution even though I selected to not show it. It keeps getting pages from categories that I excluded, including the contact page that really has nothing in common with the post other than the site name. I am very frustrated by it, and yet I admit I have not found one that is as good as this one. Do you happen to know how to get it to show up underneath each post on my main blog page? It only shows up once you click onto a post title and there’s only one post on the page. Hope that makes sense. Maybe there isn’t a way to do it? The one I have on the sidebar has the same problem. Absent when you click to my blog but it shows up if you click on a post. Thanks in advance for any thoughts! How to remove this related posts from 1 specific page? I’ll be giving YARPP a try after reading this post. I’ve tried, and in turn removed, linking post plugins before because they never seem to pull content in a sensible way – also I think my category and tag structure wasn’t great so thanks for your other articles on this topic too. However, I’ll give this one a go and see how it does. Heee.. thanks for this very help full post..
thanks a million to you people!